I like to eat out. A lot. But, I'm not sure I've ever had a meal good enough to warrant the type of treatment this Open Table reviewer wanted to bestow upon the staff at flour+water. However, I will accept this challenge. No more will I be content with Michael Bauer's nor Michelin's stars. From now on, the bar is set higher--or much lower depending on your position at the time. 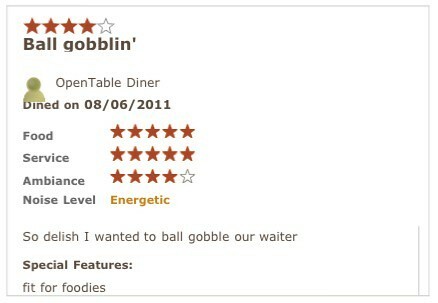 Restaurateurs, if you really want to excite me, if you truly want to have your customers sing your praises, aim for the scrotum. And don't try to fool me with some tea-bagging worthy dish. I know the difference. Or they could just settle your bar tab right? So much more easier on the scrotum one would think. Have you SEEN my bar tab? !